The Collibra Data Governance Center with Atlassian JIRA integration is using mule platform to integrate Collibra DGC with JIRA. This solution enables a user to fetch Assets of type Data Issue from Collibra and import into JIRA and vice versa. The Atlassian JIRA has issues of the type Story, Epic, Task, Improvement, New Feature, Sub task, and Bug. Every JIRA Issues has unique Issue Key. There is one toggle point used to trigger templates issue resolution or issue governance. The DGC2JIRA solution enables a user to fetch assets of type Data Issue along with related attributes such as description, issue type, priority, original name and due date with the status accepted and ingest them as issues with the status To Do into JIRA along with attributes such as description, type, priority, summary and due date. The JIRA2DGC solution enables a user to fetch the issues from JIRA having status In Progress, Done, In Review, To Do along with related attributes such as summary, key, URL, type, description, priority, due date and upsert them as an asset of type data issue with the status In Progress, Resolved, Under Review, and Accepted into Collibra DGC along with attributes such as original name, issue key, URL, issue type, description, priority and due date. 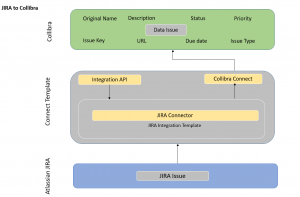 The JIRA2DGC solution enables a user to fetch issues from JIRA having status In Progress along with attributes such as summary, key, URL, type, description, priority, due date and upsert them as an asset of type data issue in Collibra DGC with status In Progress along with attributes such as original name, issue key, URL, issue type, description, priority and due date. The DGC2JIRA solution enables a user to fetch assets of type Data Issue having status Accepted along with attributes such as original name, description, priority, issue type, due date and upsert them as issues with existing status into JIRA along with attributes such as summary, description, priority, type, and due date. The template supports Issue Resolution and Issue Governance. The DGC2JIRA solution enables a user to fetch assets of type Data Issue and its respective attributes with the status accepted and ingest them as issues along with its attributes and the status as To Do into JIRA. 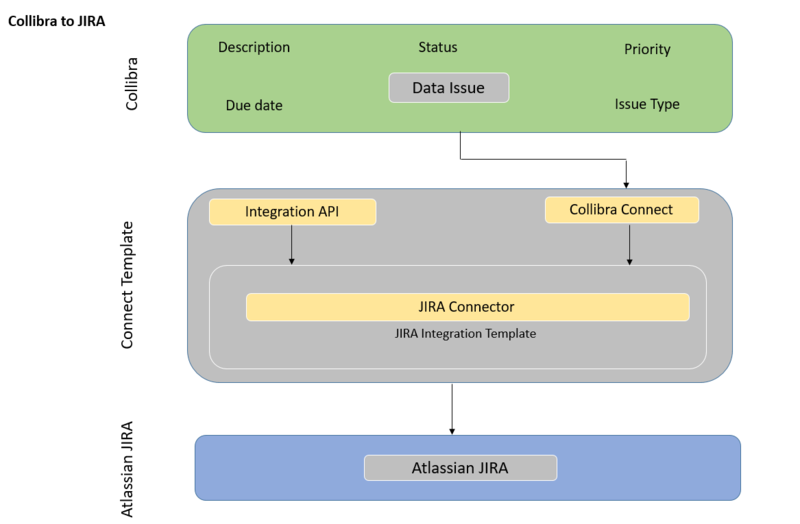 The JIRA2DGC solution enables a user to fetch the issues from JIRA with its respective status along with related attributes and upsert them as an asset of type data issue with its respective status into Collibra DGC along with the attributes. 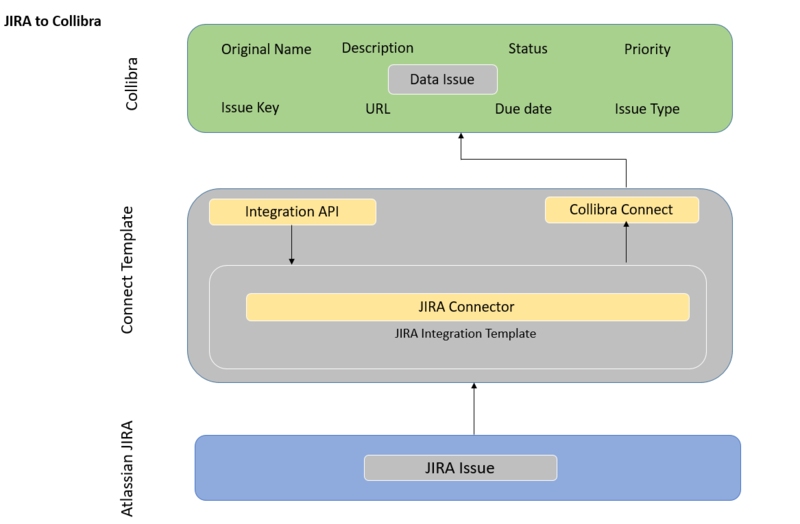 The JIRA2DGC solution enables a user to fetch issues from JIRA having status In Progress along with its respective attributes and upsert them as an asset of type data issue in Collibra DGC with status In Progress along with its respective attributes. The DGC2JIRA solution enables a user to fetch assets of type Data Issue having status Accepted along with its respective attributes and upsert them as issues with existing status into JIRA along with its respective attributes. Now the issues are getting upserting by using Jira Issue key. Import Assets with Accepted status from Collibra DGC as Issue with To Do status in JIRA. Import Assets of type Data Issue from Collibra DGC as Issue in JIRA. Import description, priority, due date, and issue type attribute from Collibra into JIRA as description, priority, due date, and type for issue in JIRA respectively. At present, the process is synchronous wherein the client has to wait until the integration completes. parameters and will have a callback in the form of email notification which will update the user about the end of the synchronization process along with the results.